Garden of Hope as it appears in Smash. Garden of Hope (再会の花園, Reunion Garden) is a stage in Super Smash Bros. for Wii U and Super Smash Bros. Ultimate. The stage is set in the area of the same name from Pikmin 3. The stage consists of two main platforms connected by a bridge. On the outer edges of the stage are a connected pair of tin lifts, which move up and down based on how much weight is on them, and will go past the blast line if too much weight is put on them (the one going up can KO) On the left platform is a fragmented but solid china pot that acts as an elevated floor; on the right side is a stick poking out of the ground that obstructs movement. Both the pot and the stick can be attacked and broken; they may also begin the match in each others' positions. Every now and then a stream of bubbles from either side heralds the arrival of a Peckish Aristocrab, which appears from where the bubbles came from and scuttles across the stage, destroying the stick and pot while dealing damage to players. The Aristocrab cannot damage the bridge, but players can, which can cause it to also break and cut the Aristocrab's presence short. After enough time has passed, various Pikmin will reconstruct each of the three broken elements. 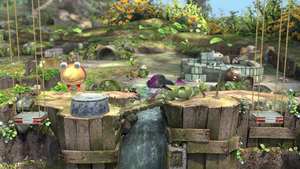 However, a Bulborb wanders around in the background, and while it will not interrupt the battle proper, its presence stops Pikmin from reconstructing anything until it leaves. If the pot is reconstructed around a character, the character will shrink to fit inside. While shrunk, their attacks deal only 0.56x the normal damage. Lightning will not spawn on this stage normally. In Super Smash Bros. for Wii U, the Ω form is a flat version of the main platform of the regular form that also extends below the blast line. The scales, Aristocrab, destructible elements, and Pikmin are absent. In Super Smash Bros. Ultimate, the Ω form and Battlefield form are similar to SSB4's Ω form; however, the main platform does not extend below the blast line and is resized and reshaped to match Final Destination and Battlefield, respectively. The designs of the three soft platforms of the Battlefield form are based on the tin lifts on the sides of the normal form. The portion of Garden of Hope that appears in the stage's background. The Garden of Hope is the second area of PNF-404 explored by Alph in Pikmin 3. The S.S. Drake, the ship used by Alph, Brittany, and Charlie, sits in the background. This portion of the area is only accessed after the Scornet Maestro is defeated and Louie is rescued. Louie, in fact, thinks that the trio of explorers has kidnapped him, and lands the S.S. Drake in the Garden of Hope. He then exits the ship, and proceeds to run up to a large cinderblock. Afterward, a huge explosion occurs, breaking the cinderblock. Louie proceeds to escape from the Koppaites, taking all of their juice and Charlie's rubber ducky. Louie is later found after the Quaggled Mireclops is defeated, along with a large fruit and all of the juice, as well as the rubber ducky. Some of Garden of Hope's lifts as they appear in Pikmin 3. One of Garden of Hope's bridges in Pikmin 3. The overall layout of the stage stays true to the original level in Pikmin 3, with a few obstacles out of place. The most notable difference is that in the actual stage, there is no waterfall. The body of water would normally lead to a Bug-Eyed Crawmad. Red Bulborbs and Peckish Aristocrabs are found in the actual level as well. Garden of Hope is universally banned from tournaments, mainly due to the Peckish Aristocrab being a deadly stage hazard. 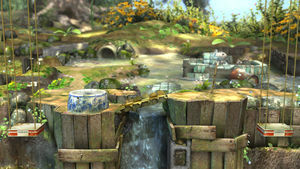 The stage also has powerful camping spots, the bridge can sometimes trap characters underneath it when it is rebuilt, and the stick and china pot can disrupt gameplay, as well as providing an easy way to unstale one's moves. Using certain throws (such as Palutena's back throw) while standing on or near the pot may cause the game to believe that the thrown character is inside the pot, causing them to shrink. They remain at their shrunken size until the pot breaks. A more detailed video on the glitch can be seen here. This glitch was patched. If either the player or opponents have their size set to mini due to a special condition in Master Orders, upon being freed from the pot said fighter will return to normal size, although they retain their high pitched voice clips. This glitch does not occur in mini Special Smash, and has not been patched. Garden of Hope in Super Smash Bros. for Wii U. The S.S. Drake sits in the background. Sonic and Luigi battle on Garden of Hope. Olimar and Mario on Garden of Hope. Using his back aerial on Mega Man. A Red, White, and Yellow Pikmin. Olimar running away from Bowser. Olimar lying down the the three original Pikmin behind him. A bridge made of stone slabs, serving as slanted ground. Donkey Kong holding onto the edge of the tin lift. A purple Pikmin on top of a fallen Zelda. Rathalos attacking Lucas on the stage. Togedemaru using Zing Zap on Pit and the Ice Climbers on the stage. In Super Smash Bros. Ultimate, Garden of Hope is used for the most Spirit battles, at 26 battles total across all three forms. This page was last edited on April 17, 2019, at 02:34.